Centennial Bank Small Change Matching Raises over $4,000 for the Foundation in 2018! 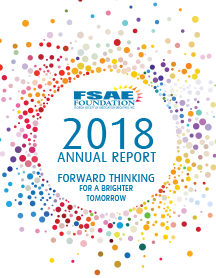 Learn more about how your contributions impact the association industry through education and professional development for all FSAE members. Thank you Rapid Press for sponsoring this report! Foundation Mission: Support education, research, professional development, publications, and public relations efforts for the association management professional. The FSAE Foundation is a 501(c)(3) organization founded in December 1984 with the purpose of enhancing the Society’s programs and services through education, grants, research and certification initiatives. The FSAE Foundation continues to be supported entirely by voluntary, tax-deductible contributions and grants from corporate donors. Since 2002, the Foundation has awarded 290 grants totaling $172,985 for members to attend educational conferences or earn their CAE/CMP designations. Over $262,700 has been used to underwrite speakers and education at the FSAE Annual Conference and over $299,000 has been used to implement Foundation initiatives including industry reports and surveys. Giving back to your profession guarantees that association professionals will continue to have the best education and resources available to excel in their career, and in the industry. Through being a bellwether in the field of nurturing leaders in association management, the FSAE Foundation will develop engaged and qualified professionals whose use of best practices and standards of excellence benefit all in association management and its supporting industries. We intend to move the FSAE Foundation from an "A" organization to an "A+" organization by strengthening the leadership position of the FSAE Foundation as a "thought leader" among key constituents - donors, FSAE members, and other leaders in the association management arena.